Terry is carrying a portable thumb scanner seeking donations for the Hill Valley Preservation Society. Earlier, the Cafe 80’s had encouraged customers to “Pay Up” and used a thumb graphic. Later, Biff pays for his cab ride with his thumb. 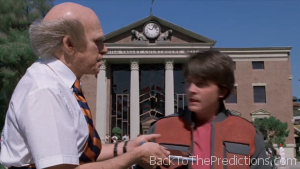 It’s clear that using your thumb to pay for things is fairly commonplace in Hill Valley of 2015. The novelization even mentions that there’s a surcharge for using cash. Apple Pay uses NFC signals between your phone and the NFC reader to create a secure transaction. Your thumb (or other digit) on your iPhone’s button sensor will signal that the payment is authorized. Soon, you’ll also be able to use your Apple Watch to complete these transactions. Apple Pay may not be as widespread as it is in Hill Valley, but it exists and can be used by any newer iPhone owner at more than 40 major retailers and restaurants across the United States.